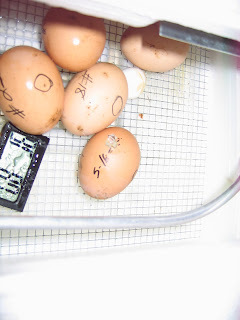 Here is an update on our incubation of our Rhode Island Red eggs. 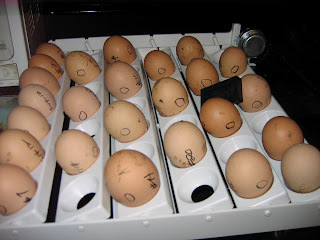 We put 25 eggs into the incubator over the course of three days. Each was dated and numbered. The left row netted no embryos at all. We had some that formed half way and then had died in their egg at different stages of development. I called my neighbor and he said he as well as our neighbor up the road was having the same issue. These two guys have been doing this for years and have never had issues like this. We all spoke and tried to find a common denominator. We found that we were feeding different feeds and had nothing that seemed to link our problems except the weather. The weather here in Connecticut has been rainy and the barometric pressure has been up and down. and she will be going to a friend who has 4 other chicks in her brooder and we will try again next week to hatch some new chicks! 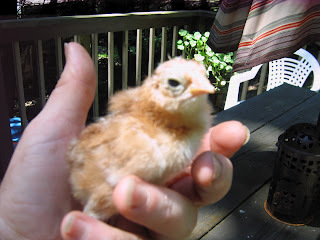 A new "beast" added to the farm! Pollen Trap and our first pollen harvest!